As the government shutdown stretches into a possible fourth week, metro families of federal employees continue to feel strains and stress at home. KANSAS CITY, Mo. — As the government shutdown stretches into a possible fourth week, metro families of federal employees continue to feel strains and stress at home. In Shawnee, Mary Alice Kelly’s husband was forced to stay at home beginning on Dec. 22. Since then, the family has received no paychecks and had no luck getting a loan to cover expenses. 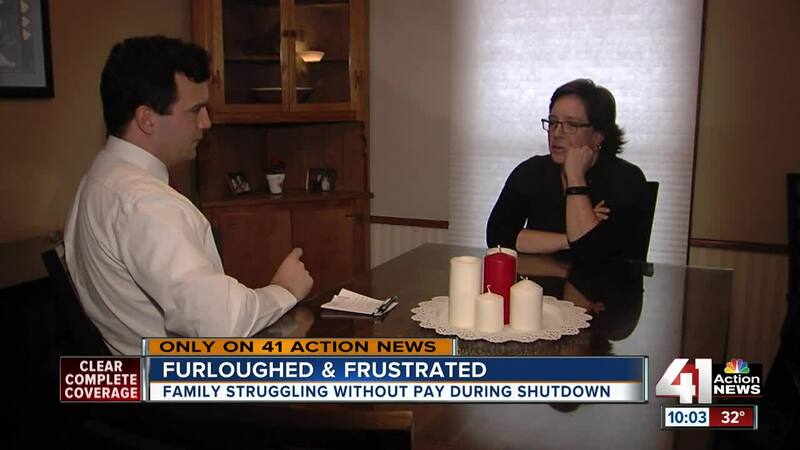 For Kelly, the shutdown has led to plenty of stress inside the family’s home. Dinners are often quiet at the table, calls home from a daughter in college can sometimes be filled with tears, and the anxiety of not knowing how much longer the shutdown will last. The deadlock in negotiations between Republican and Democratic lawmakers has led to Kelly feeling even more frustrated over the shutdown. Over the last few weeks, she has sent emails and calls to lawmakers representing Kansas and the White House. However, the effort usually ends with similar responses. Hundreds of thousands of federal employees across the country have been experiencing similar situations as the shutdown drags on. In the metro, several restaurants have stepped up to help the families impacted by the closure. Owner Jimmy Fratze told 41 Action News that offering a comforting meal was a small way to assist them. With no paychecks and no deal currently in the works, Mary Alice Kelly hoped the situation in Washington, D.C. would soon change. “I guess we just sit and wait which is about the most frustrating thing to do,” she said.